Among casual sky-watchers, Pluto is best known for having its status downgraded from planet to dwarf planet in 2006. That has changed over the past few weeks, as NASA’s New Horizons Probe prepares to fly within 8,000 miles of Pluto on Tuesday, July 14. New Horizons is already sending back loads of fascinating images of Pluto and more are sure to come. You can get all the latest updates by following @NASANewHorizons on twitter. For more background about the discovery of Pluto and what scientists know so far about the “contentious little planet,” I recommend Nadia Drake’s excellent “Pluto At Last” at National Geographic. It may no longer be called a planet, but this week, Pluto is the star. 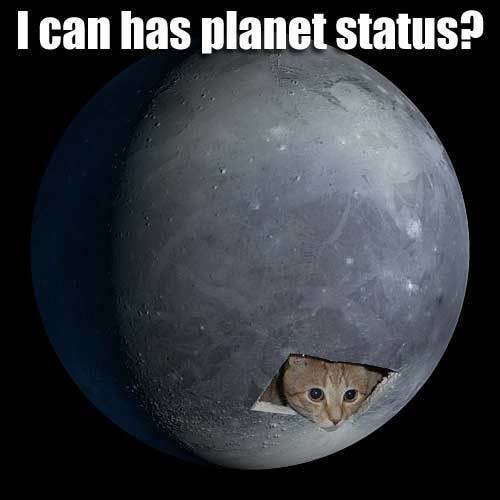 This entry was posted in Science Caturday and tagged New Horizons Probe, Pluto flyby, Pluto Mission, science cat. Bookmark the permalink.